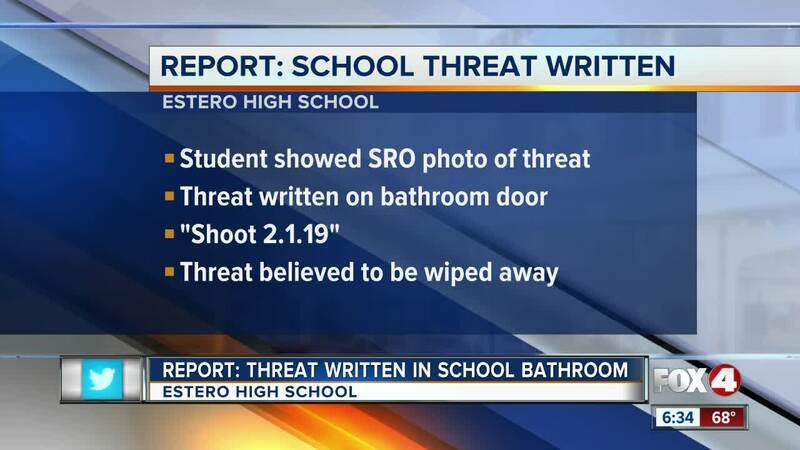 ESTERO, FLa. — Tonight, we're learning about a possible school threat at Estero high school. It happened a day after Lee County schools and law enforcement launched an initiative to tackle fake school threats. According to a sheriff's office report, on Tuesday, students approached a resource officer and showed them a picture of a threat written on the bathroom door. It read "shoot 2-1-19." The officer investigated and believed someone who was cleaning the bathroom may have wiped it off. Making a fake threat could lead to a felony on student's record.